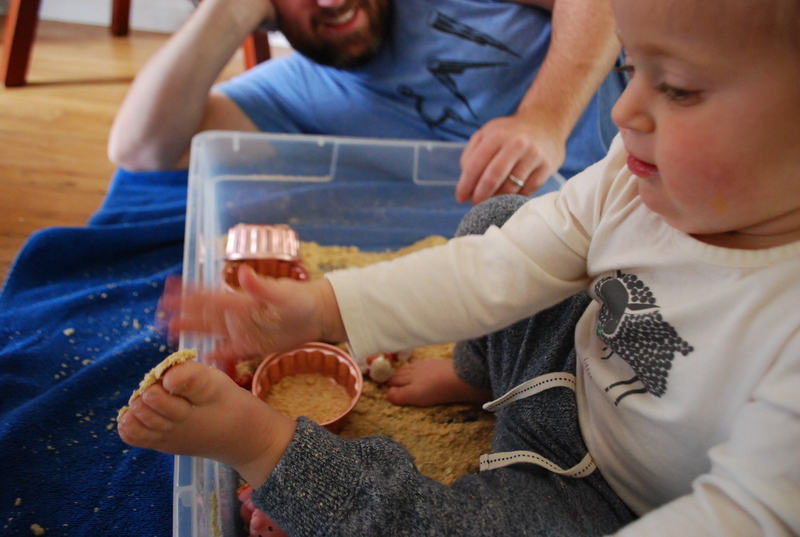 Ellie has been really interested in sensory experiences lately. Every meal gets wiped across the high chair, washing hands becomes a quick splash in the fountain and taking a walk always includes finding patches of dirt to dig in. 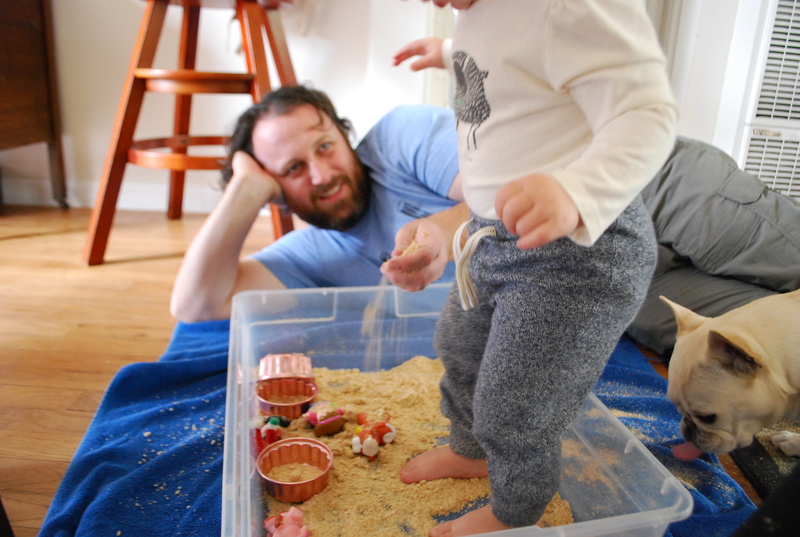 So I’ve been eager to find new and exciting sensory experiences for her. 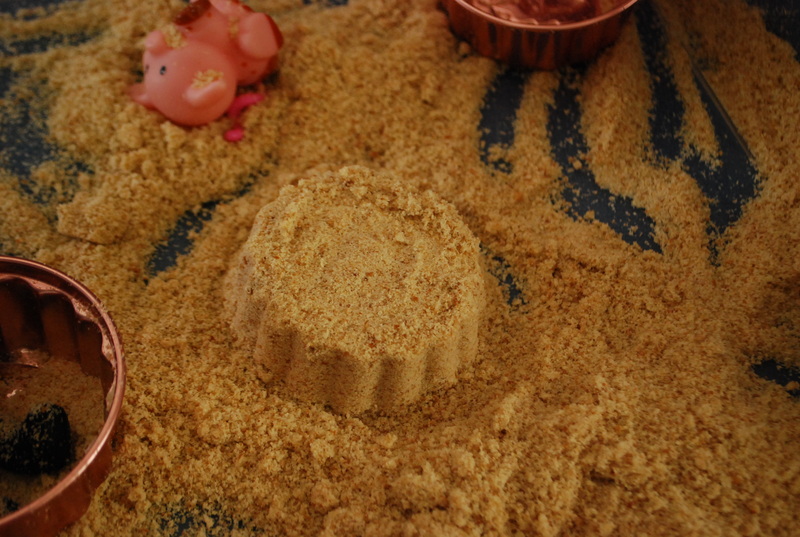 The other day I stumbled upon this wonderfully inspiring and helpful blog and found her recipe for Edible Pretend Snow. 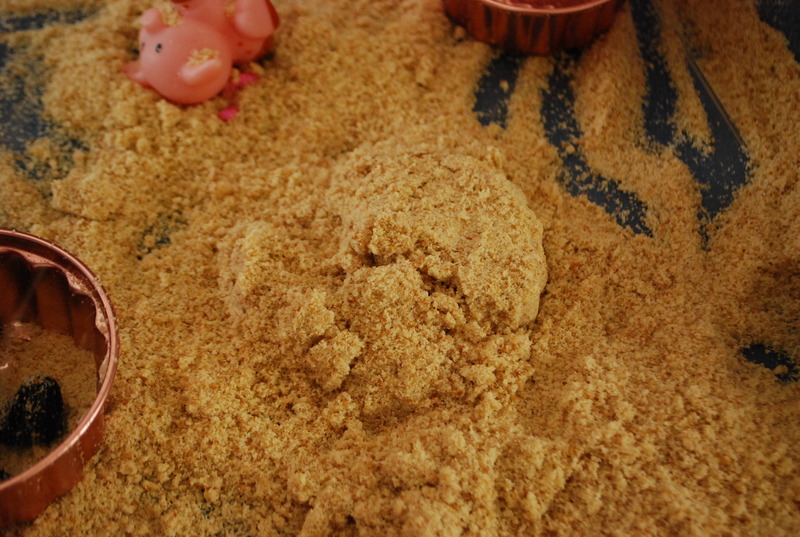 I had never heard of using bread in a sensory bin before but was intrigued by what she said would happen to its texture when put through the food processor. We happened to have half a loaf of partly stale bread we were going to save for the birds or croutons if Jeff got around to it, so I went to work throwing the loaf into the food processor for a new sensory experience for Ellie. Because it was wheat bread, the color was much less “snow-like” and more “sand-like”. 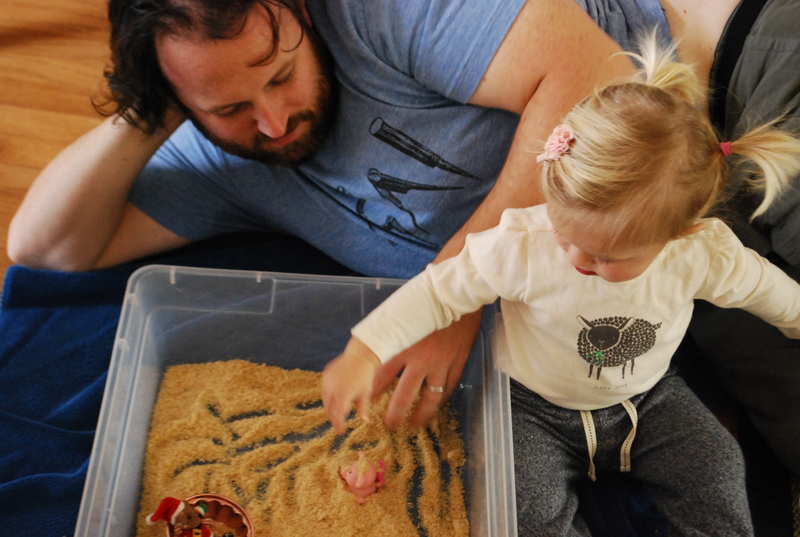 But, that certainly didn’t stop Ellie (and her Daddy) from enjoying a fun morning of exploring what I like to call the “Sandy Snow Sensory Bin”. I threw in some random containers and some Little People to manipulate. The texture was so neat. It was soft like snow but grainy like sand and you could squish it between your fingers and form it into masses. Ellie decided to get in and feel the textures with her feet too of course (watch out for bread eating dogs too). Ellie found that the Sandy snow would get stuck to her foot though and ended up enjoying it from outside of the tub instead. 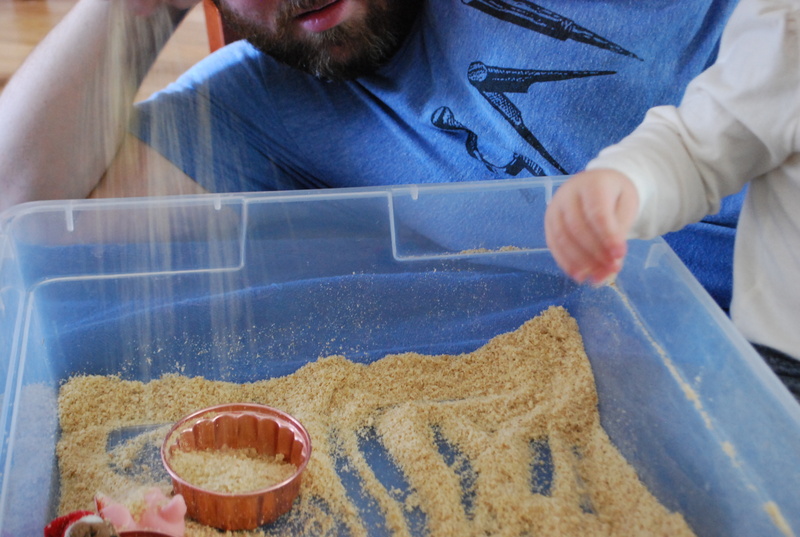 It was a neat sensory tub and I’m glad we got to try it. I definitely wouldn’t do this very often, seeing that you use up almost a whole loaf of bread (when we were done with ours, we added the bread crumbs to the bird feeder outside and watched the little sparrows flock). It also doesn’t keep well. By the end of the day, our bin was smelling like yeasty mush (thus it became bird food). But, it the Sandy snow was a different texture for Ellie to explore and a fun part of our day. 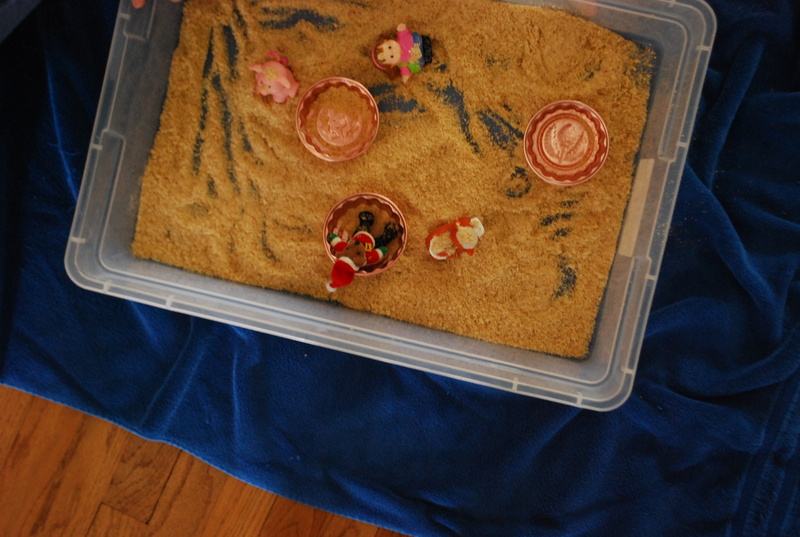 This entry was posted in making and tagged sandy snow, sensory bins, toddler activities. Bookmark the permalink. Ha! i love how she is standing in the bin! Too cute!